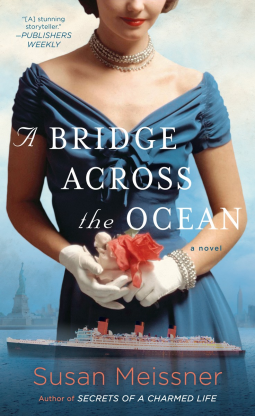 What They Say....Wartime intrigue spans the lives of three women—past and present—in the latest novel from the acclaimed author of Secrets of a Charmed Life. What I Say....I started this book on vacation, and I thought it was something else. I was about a quarter way in when I realized it wasn't the book I thought I had chosen and then I realized I didn't care. Brette has always known that she has a gift, she sees and hears people that others don't. However, she's spent her whole life trying to hide her abilities in an effort to have a "normal" life. But she is asked to visit the Queen Mary in an effort to help a young child who has lost their mother, so she puts her own concerns aside in an effort to help. Brette's story was interwoven, but as it so often happens with novels that go back and forth in time, I was much more interested in the story set during the end of WWII. There are two women who appear to be on very different paths collide on the Queen Mary in order to come to America to join their husbands. Not everyone is who they appear to be, and I found myself irritated when the storyline would switch time periods, but that's a good thing because I was so interested in the storyline. This was a great read, and the way the stories all came together at the end was entirely satisfying. Highly recommend this book.